According to this book, America has already lost the war. While conducting extensive research and fieldwork in Afghanistan’s war zones, a drumbeat of off-the-record and offhand remarks pointed the author to one conclusion: "We blew it." The sentiment was even blazoned across a US military fortification, as the author saw at Forward Operating Base Mehtar Lam in insurgency-wracked Laghman Province: "I glanced over at a concrete blast barrier while waiting for a helicopter," Wissing says. "Someone had spray-painted in jagged letters: ‘The GAME. You Lost It.’"
The author’s vivid narrative takes the reader down to ground level in frontline Afghanistan. It draws on the voices of hundreds of combat soldiers, ordinary Afghans, private contractors, aid workers, international consultants, and government officials. 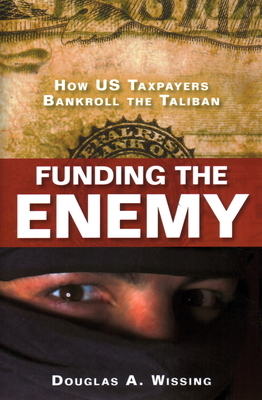 From these contacts it became glaringly clear, as the author details, that American taxpayer dollars have been flowing into Taliban coffers, courtesy of scandalously mismanaged US development and counterinsurgency programs, with calamitous military and social consequences. This is the first book to detail the toxic embrace of American policymakers and careerists, Afghan kleptocrats, and the opportunistic Taliban. The result? US taxpayers have been footing the bill for both sides of a disastrous Afghanistan war. Douglas A. Wissing is an award-winning independent journalist who has reported widely on the war in Afghanistan for print, radio, and the Web. He has contributed hundreds of stories to media outlets that include the New York Times, the Washington Post, the Los Angeles Times, Asia Times, Forbes Life, the Independent on Sunday (UK), Salon, and National Geographic Traveler, as well as the BBC, VOA News, and NPR networks. He is the author of six books, including Pioneer in Tibet: The Life and Perils of Dr. Albert Shelton. "Sober, sad, and important, Funding the Enemy peels back the layers of American engagement in Afghanistan to reveal its rotten core: that United States dollars meant for that country’s future instead fund the insurgency and support the Taliban. Paying for both sides of the war ensures America’s ultimate defeat, and Wissing’s book tells the story." "Wissing presents a compelling viewpoint of how national security objectives are pursued and how war is waged in the modern, asymmetric battlespace. In particular, his insightful analysis of the Afghanistan war—its funding mechanisms, lack of coherent strategy, and weak interagency cooperation and synergy—should be required reading for all. One of his most poignant phrases, ‘The United States couldn’t kill its way to victory, nor could it buy it,’ suggests that how we have traditionally waged war isn’t working, implicitly asking this question: What can we do to clean up our act?" "[A] sobering account of the attempts by several US administrations to both wage war in and provide aid to Afghanistan, often with confusing and contradictory results. Backed by extensive interviews as well as on-the-ground embedded-reporter experience, the book illustrates the nearly impossible task of nation building in a country with a long history of factional friction and transactional corruption." "Wissing’s meticulous marshaling of . . . devastating facts along with cogent perspectives gleaned from actors on the ground is timely and of considerable value. [His] blunt, succinct, yet responsible style leaves the reader with no doubts that new ways forward must focus on the people of Afghanistan who have been ill-served by their friends as well as their leaders for too long. . . .[A]n honest reading of Funding the Enemy should be required . . . as new paths are forged."